A sensual program with changes in temperature, clothing, lighting, and acoustics. A series of distinct spaces are threaded together with a corridor that acts as a lens to the program with a specific focus on the plunge experience. The pool house becomes as much an exhibition of its own program as well as the human body. Sectional Model, 1/2" = 1'-0." Paper, fabric, wood, MDF, acrylic, steel. The model pictured above includes section cuts of the (from left to right) changing rooms, aromatic pool, sauna and plunge pool, and the lap pool. 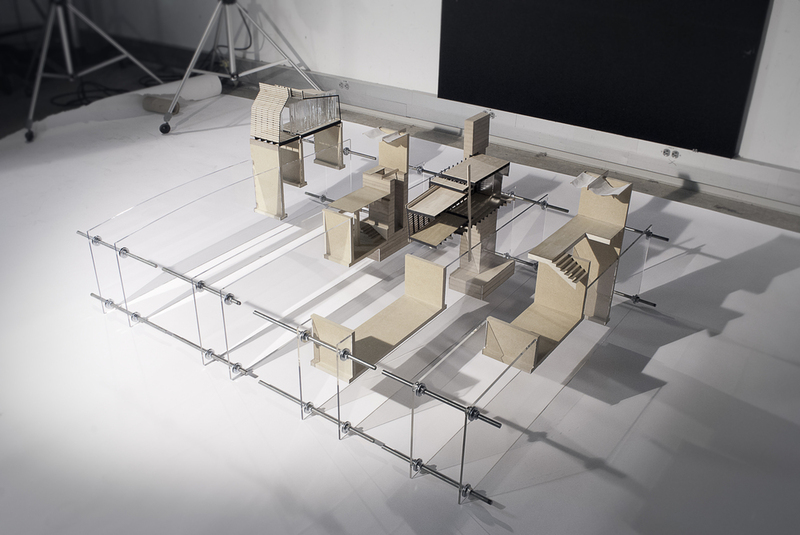 The model's construction seeks to express each piece's distinct relationship with the ground plane, represented by the clear plastic planes. Additional images included at the bottom of the page. The corridor’s structural grid creates a rhythm reinforced by visitors’ passing in and out of the ground plane as they move between pools. The column spacing rapidly decreases itself as visitors approach the plunge pool to express anticipation.